Quantum entanglement is the idea that the properties of a pair or group of particles depend upon each other, even if the particles are separated by great distances. For example, if one particle is spinning in a clockwise position, the other in its pair will spin the opposite way, if they are entangled. This relationship persists even if the particles are thousands of kilometers away, Goodson said. "It turns out that if you have photons that are entangled, that high degree of correlation can interact with molecules of proteins in a different way than if they're not entangled," Goodson said. "We are able to probe the properties of the proteins with extremely small numbers of photons." Entangled photons are produced by sending laser light through a crystal no bigger than the tip of a fingernail. When the light travels through the crystal in a certain way, some of the photons become entangled. These entangled pairs are then used to examine the target molecules. These photons excite electronic states in the protein. Based on the electromagnetic radiation the molecule emits when excited by the photons, Goodson can determine specific properties about the molecule, a method called spectroscopy. The number of photons required for entangled photon spectroscopy is extraordinarily low compared to traditional laser spectroscopic methods. "Can you imagine doing an investigation where you can use 10 orders of magnitude fewer photons to probe the particular characteristic of a material, biological sample, or very small amount of a chemical on a surface?" Goodson said. Using this method, Goodson and his team were able to see a new interaction within a flavin protein. 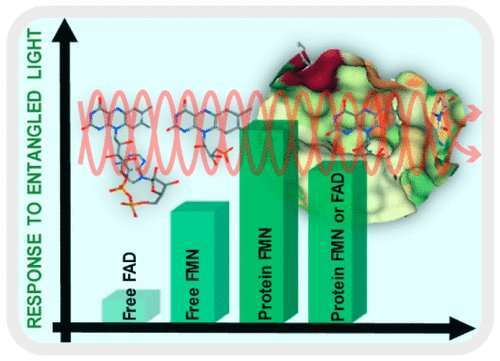 Looking at flavoproteins, the team was able to see differences in their spectroscopy using quantum entanglement compared to using classical light. The method opens up new avenues for imaging microscopy, Goodson said. Watching entangled photons interact with molecules in proteins may teach scientists something new about the electronic states of these molecules. "For example, in photosynthesis, when photons provide energy for the photosynthetic reaction center, the mechanism of this effect could be enhanced by using quantum light," he said. "With an entangled photon excitation process, it may be possible to optimize as well as enhance the energy transfer processes in biological systems. This could lead to new information about the chemical and biological processes in these naturally occurring biological complexes." Next, the group hopes to study the properties of organic and biological molecules using entangled photons in a microscope. The study's co-authors include Juan Villabona-Monsalve and Oleg Varnavski in the U-M Department of Chemistry and Bruce Palfey in the U-M Department of Biological Chemistry.